How do I use the Interval Pin Scheduling feature? 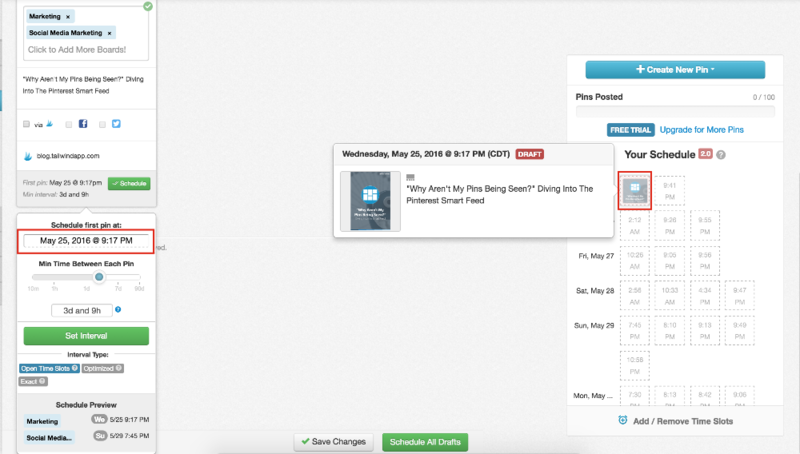 Interval Pin Scheduling is the best tool to spread your content out over a period of time... but we know that sometimes learning how to utilize a feature like this can be difficult. Luckily, we are here to help! Here is an in-depth tutorial video of how to schedule pins in an Interval setting. "Open Time Slots" will place your pins into the first available slot in your Tailwind schedule after the minimum amount of time you set has passed. This is a great option because you are able to create your schedule (with optimized timeslots) and stay within your schedule while adding content to your queue. To get started simply add your boards (reminder: 2 or more) and select "Use Interval"
2. 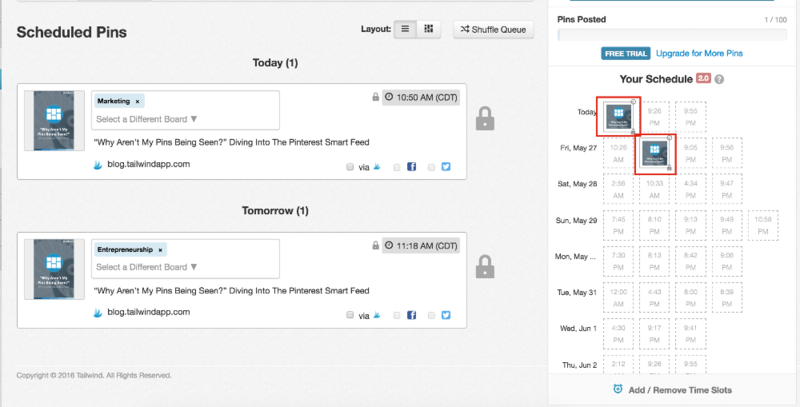 The “Schedule First Pin at” time will show you when the first pin will be scheduled to post. The "Scheduled First Pin at" will always take the next available timeslot. This lets you know that when you schedule your Pins, the first pin will be inserted into your schedule directly in that first available time. 3. Set the Minimum Time Between Each Pin. This will be the time in between each Pin is scheduled. Tailwind will notice the Interval time you set and save it for the next time you use the interval feature. This way you don't have to enter it in each time! 4. Select Open Timeslots under "Interval Type" and confirm that your Pins will be published where you expect them to by looking at the "Schedule Preview." Note: They will all be in current timeslots. 5. And now you are all set with your Pins scheduled within your optimized timeslots! 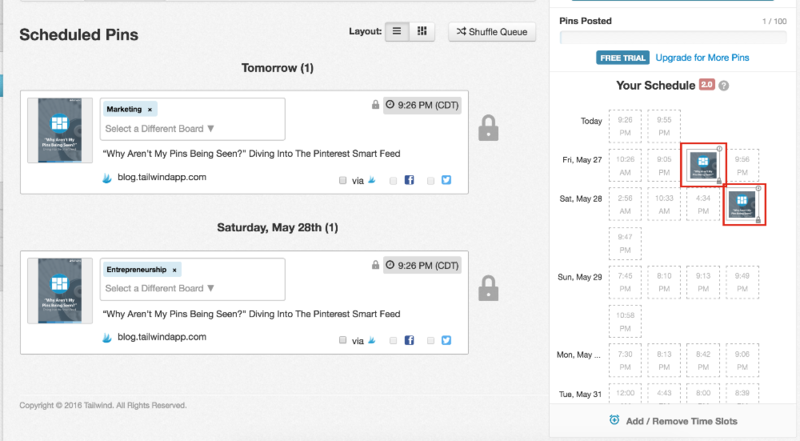 What if you want your scheduled pins to show up at an exact time during the day? You use the "Exact" option, of course! Even if your Tailwind schedule doesn't show an available time slot, your pins will show up exactly at the time you choose. This is also a great option for scheduling a new pin without disrupting your established pinning schedule. To get started simply Follow steps 1- 3 from above. Note: for step 2, the start time will automatically be the next available timeslot. If you would like to change the start date, click into the "Schedule First Pin At" box and specify a specific start date. 2. 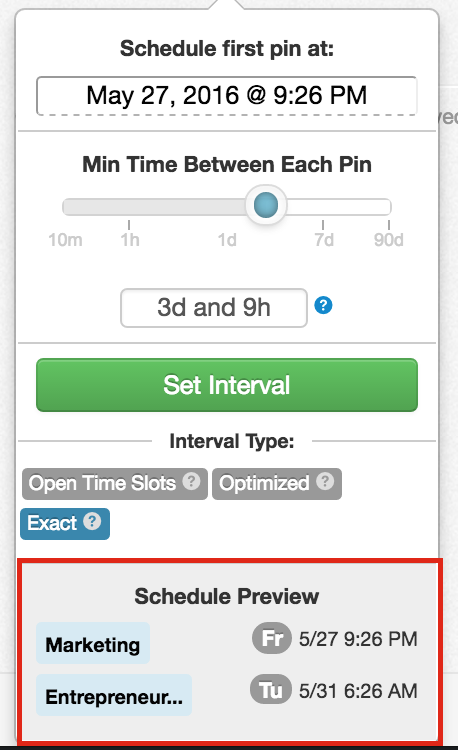 Select "Exact" under "Interval Type" and confirm that your Pins will be published where you expect them to by looking at the "Schedule Preview" Note: they will be scheduled the exact time each day. 3. 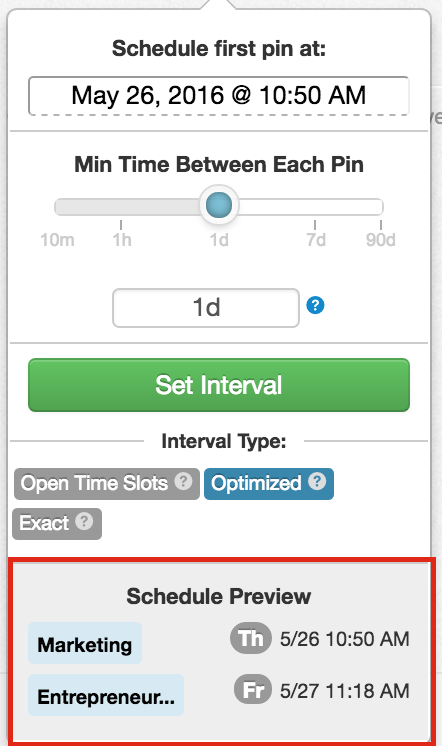 Once you select "Set Interval" and "Schedule" you will then see the pins as scheduled. Note: your "Exact" scheduled Pins will be marked with a lock and clock. These symbols let you know that these Pins were scheduled at an exact time and will not be effected by the Shuffle feature. Read more about locking Pins below. The "Optimized" option allows you to make use of Tailwind's recommended pinning times, while still pinning outside of your recurring schedule. This method will schedule your pins using your existing optimal time slots as guide markers to create new times to schedule your pins, while abiding by the minimal time interval you set. 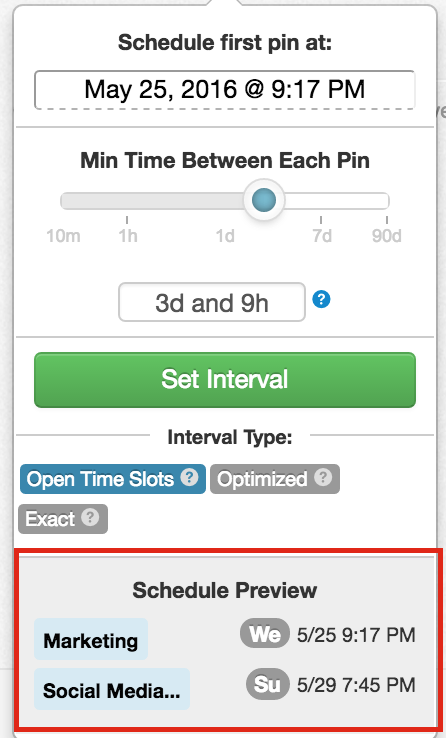 Select "Optimized" under "Interval Type" and confirm that your Pins will be published where you expect them to by looking at the "Schedule Preview." Note: They will all be scheduled for various new times depending on the interval time and start date you set. 3. 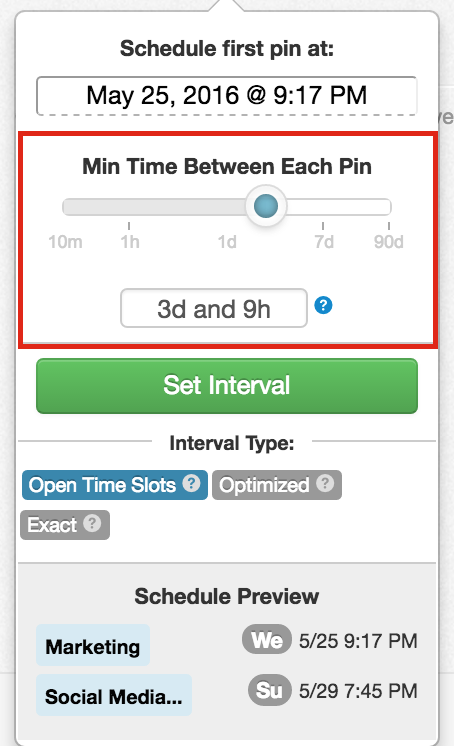 Once you select "Set Interval" and then "Schedule" these Pins will appear in your Schedule, marked with a lock and a clock. Helpful tip: Looking to create two schedules in your calendar? Use your Schedule to create a recurring pinning schedule (perfect for your own content) and quickly send your Pins into your schedule each week. Then schedule others content with Optimized or Exact option and clearly differentiate them by the clock in the top right corner. Both Exact and Optimized pins are considered " manual pins," and will be marked with a clock icon, reminding you that they are slated to post outside of the standard Tailwind schedule. You may also notice that there is a "lock" icon on all of your Interval pins. The lock on each interval Pin signifies that that Pin will not be shuffled when editing your Schedule. Feel free to manually drag and drop the pin. Learn more about "locked" Pins in the "Locking Pins" article.